1765 meets 1795. We can build ’em all! 9. Silhouettes purchases all the materials for those items selected & agreed upon in the quote, & begins construction. 10. If you live close enough to Clark, Wyoming, a fitting for undergarments is best done in the privacy of the Shoppe (maps will be included). This is included in your price. If you can’t get here, arrangements will be made for shipping garments for fittings. We can build everything from measurements, but it is risky, as it can be difficult to measure yourself, so measurements & fittings are preferred at the shoppe. Our expert corsetierre will assist with customizing undergarments for those who can come to Wyoming. 11. Adjustments will be made as needed, & undergarments are completed. At this point, new measurements in the undergarments need to be made by you or at the shop. (Dresses “robes” are designed to fit over appropriate undergarments, although by arrangement, we can work with modern shapes. These are the things discussed in the rough quote). 12. The outer garments will be built next, based on measurements taken in historic undergarments. At this point, you may want to keep what has been made to have ready for the next fitting. 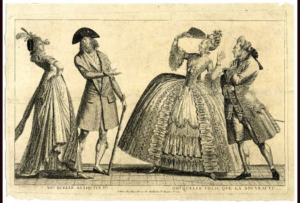 Fittings are very important as most historical fashions were either draped or tailored to the body. 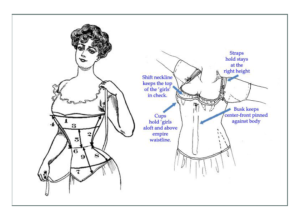 Fitting Stays or Corsets takes careful measurement, attention to detail, & good intuition based on experience. A large part of the design process is determining if you need your costume to adapt to other eras (e.g. short stays of 1800 can be used back to 1780 or forward to 1825 depictions), or to mix and match with other things you own or would like to own in the future. We can build your costume to depict multiple characters and to work in different weather, climates, or seasons.